Food supplement based on 100% natural active ingredients for people with nervous tension, anxiety, restlessness and irritability. Ingredients: lactose monohydrate, St. John's wort extract, passion flower extract, lemon balm extract, valerian extract. Reduces the tension caused by daily stress, induces relaxation and tranquility, and improves the emotional equilibrium. - emotional disturbances characteristic of premenopause, menopause, and premenstrual syndrome. Adults: 1 capsule 2-3 times daily. The administration period is 4-6 weeks. 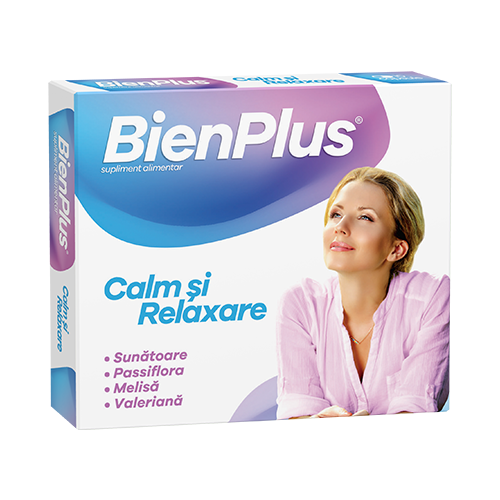 Bien Plus® Calm si relaxation, capsules may be readministered after 1 week intermission. - Store at temperatures below 25ºC, in original package. - The Recommended Daily Intake should not be exceeded. Cardboard box containing 1 blisters with 10 capsules.